We describe the agar-beads method to establish persistent long-term chronic Pseudomonas aeruginosa airway infection in the mouse model. Facchini, M., De Fino, I., Riva, C., Bragonzi, A. Long Term Chronic Pseudomonas aeruginosa Airway Infection in Mice. J. Vis. Exp. (85), e51019, doi:10.3791/51019 (2014). A mouse model of chronic airway infection is a key asset in cystic fibrosis (CF) research, although there are a number of concerns regarding the model itself. 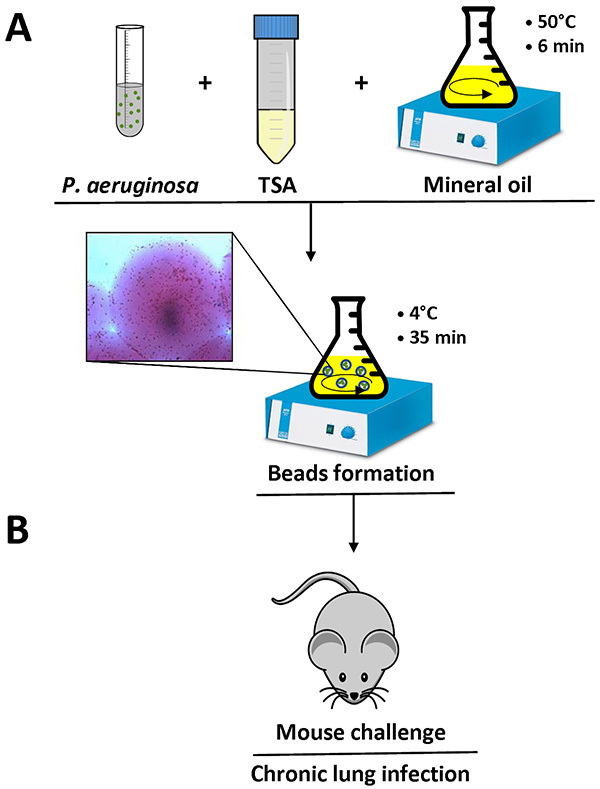 Early phases of inflammation and infection have been widely studied by using the Pseudomonas aeruginosa agar-beads mouse model, while only few reports have focused on the long-term chronic infection in vivo. The main challenge for long term chronic infection remains the low bacterial burden by P. aeruginosa and the low percentage of infected mice weeks after challenge, indicating that bacterial cells are progressively cleared by the host. This paper presents a method for obtaining efficient long-term chronic infection in mice. This method is based on the embedding of the P. aeruginosa clinical strains in the agar-beads in vitro, followed by intratracheal instillation in C57Bl/6NCrl mice. Bilateral lung infection is associated with several measurable read-outs including weight loss, mortality, chronic infection, and inflammatory response. The P. aeruginosa RP73 clinical strain was preferred over the PAO1 reference laboratory strain since it resulted in a comparatively lower mortality, more severe lesions, and higher chronic infection. P. aeruginosa colonization may persist in the lung for over three months. Murine lung pathology resembles that of CF patients with advanced chronic pulmonary disease. This murine model most closely mimics the course of the human disease and can be used both for studies on the pathogenesis and for the evaluation of novel therapies. Cystic fibrosis (CF) is a genetic disease caused by mutations in the cystic fibrosis transmembrane conductance regulator (CFTR) gene. This gene encodes for a chloride channel expressed on the membrane of most epithelial cells. Bronchiectasis, mucus plugging and parenchymal destruction caused mainly by Pseudomonas aeruginosa infections progressively lead to severe lung disease and mortality in most of the CF patients1. Understanding CF pathogenesis and further development of novel therapies rely on animal model with characteristic features of CF. Several mice, genetically modified for the Cftr gene, have been generated, but limitations in the ability of these species to recapitulate CF-like lung disease and several other organ abnormalities seen in CF patients have been widely documented2. Development of infection is one of the major challenges in CF animal model. The literature clearly suggests that a chronic infection lasting more than one month can be achieved only if mice are inoculated with bacteria embedded in an immobilizing agent such as agar, agarose, or seaweed alginate3-5. These immobilizing agents provide the microaerobic/anaerobic conditions that allow bacteria to grow in the form of microcolonies, similarly to the growth in the mucus of CF patients6. This model of chronic infection leads to the persistence of the bacteria in the lungs causing airway inflammation and damage7. However, depending on the method used, the bacterial strain and the dose inoculated in the lungs, the percentage of chronic infected mice and the bacterial load recovered in the lungs at different time points can differ considerably. In particular, the main challenge for long-term chronic infection remains the low bacterial burden by P. aeruginosa and the low percentage of infected mice weeks after challenge, indicating that bacterial cells are progressively cleared by the host. By selecting the P. aeruginosa RP73 clinical strain from a collection of CF isolates8 we successfully obtained low mortality, more severe lesions, and high percentage of chronic infection with a stable bacterial load up to one month in C57Bl/6NCrl mice. This paper details the methodology for embedding P. aeruginosa in the agar beads; we have infected mice by intratracheal instillation, measured the bacterial load and cytokines in lungs, collected BAL fluid and performed histological examination. Overall, this protocol will aid researchers in addressing fundamentally important questions on pathogenesis8,9 and testing novel therapies against P. aeruginosa chronic infection10,11. Select the appropriate P. aeruginosa strain to be tested. Inoculate a loopful of P. aeruginosa from a -80 °C stock culture to a Trypticase Soy Agar (TSA) plate and incubate at 37 °C overnight. Pick a single colony and inoculate into 5 ml Trypticase Soy Broth (TSB) in a 15 ml snap-capped tube and incubate at 37 °C overnight in a shaking incubator at 200 rpm. Take a small aliquot of bacterial overnight culture, dilute 1:50 in phosphate buffered saline (PBS) and measure the optical density (OD) at 600 nm. Dilute the overnight bacterial culture by adding 2 OD in a new snap-capped tube containing 20 ml of fresh TSB. Incubate at 37 °C for approximately 3-4 hr to log phase in a shaking incubator at 200 rpm, until a total of 10-15 OD is reached. In the meantime, prepare the TSA, made of TSB with 1.5% agar, autoclave and equilibrate at 50 °C in a water bath. Equilibrate 150 ml of preautoclaved heavy mineral oil in an Erlenmeyer flask at 50 °C in a water bath. Once P. aeruginosa reaches the log phase, collect the bacterial cells by centrifugation at 2,700 x g for 15 min at 4 °C and discard the supernatant. Resuspend the bacterial pellet in 1 ml of sterile PBS and vortex thoroughly to resuspend the pellet completely. Mix 1 ml bacterial suspension with 9 ml of liquid TSA pre-equilibrated at 50 °C. Add the 10 ml TSA-P. aeruginosa mixture to heavy mineral oil (prewarmed at 50 °C) and immediately stir for 6 min at room temperature. The agitation must produce a visible vortex in the oil. Cool the mixture to 4 °C, stirring at the minimum speed for 35 min (Figure 1). Rest the agar-beads-oil mixture in ice for an additional 20 min. Transfer the agar-beads into 50 ml Falcon tubes and centrifuge at 2,700 x g for 15 min at 4 °C. Accurately remove mineral oil and wash with sterile PBS six times, as described in step 2.11. After three washes, the beads can be pelleted by gravity instead of using the centrifuge. After the last wash, resuspend the agar-beads in 20-30 ml PBS. Take an aliquot of the beads (approximately 0.5 ml) and aseptically homogenize. Take 100 µl of the homogenized beads and dilute in 900 µl of sterile PBS. Serially dilute 1:10 down to 10-6. Plate serial dilution on TSA plates, including undiluted sample down to 10-6 and incubate plates at 37 °C. Measure the bead diameter using an inverted light microscope in several fields. The bead diameter must be between 100-200 µm (Figure 1). Store the beads overnight at 4 °C. Figure 1. Overview of the agar beads preparation and mouse infection. P. aeruginosa cells are resuspended in 1 ml of PBS and added to 9 ml of liquid TSA (50 °C). This mixture is added to 150 ml heavy mineral oil at 50 °C in a flask and stirred at high speed for 6 min at room temperature. When the flask is cooled to 4 °C with a slow stirring for 35 min, the agar solidifies creating beads, and bacteria present in the mixture are embedded into the agar beads. Detail of an agar bead containing bacterial cells is shown (A). After removing the mineral oil with several washes using sterile PBS, the agar-beads suspension is ready for inoculation in the lungs of mice by an intratracheal injection (B). Click here to view larger image. Ethics Statement: This protocol and experimentation follow the guidelines from the animal care and ethics committee of San Raffaele Scientific Institute. Count the number of Colony Forming Units (CFU) on the TSA plates to determine the number of CFU/ml in the agar-beads suspension. Dilute the agar-beads with sterile PBS to 2-4 x 107 CFU/ml to reach an optimal inoculum of 1-2 x 106 in 50 µl. Anesthetize C57Bl/6NCr (20-22 g, 6-8 weeks old) male mice with ketamine (50 mg/ml) and xylazine (5 mg/ml) in 0.9 % NaCl administered at a volume of 0.002 ml/g body weight by intraperitoneal injection. NOTE: Anesthesia is considered adequate when the animal stays still quietly, is unresponsive to external stimuli, and has constant heart and respiratory rates. Place the mouse in supine position. Disinfect the coat of the mouse with 70% ethanol. Expose the trachea by a vertical cut of the skin and intubate the trachea with a sterile, flexible 22 G 0.9 mm x 25 mm I.V. catheter, keeping attention to remove the stylette while moving down into the trachea. Insert the catheter not too deep into the trachea. Stop before reaching the carina (bifurcation). Immediately take a volume of 50 µl of agar bead suspension by a 1 ml syringe and attach it to the catheter. Gently push the plunger of the syringe, allowing the beads to be implanted into the lung. Close the incision using suture clips. Place the animal on a heating pad until fully awake. Observe the mice daily for clinical signs including coat quality, posture, ambulation, and hydration status. Monitor daily body weight. Mice that lose ≥20% body weight must be euthanized. Follow Point 5 for collection of bronchoalveolar lavage fluid (BAL) and Points 6 or 7 for the collection of lungs and the analysis of total CFU, histological analysis, inflammatory response in terms of total and differential cell count in the BAL, cytokine analysis, and myeloperoxidase (MPO) activity. Euthanize the mice by CO2 inhalation. Place the mouse in the supine position. Disinfect the coat of the mouse with 70% ethanol. Expose the trachea and the thoracic cage by a vertical cut of the skin. Expose the lungs by cutting the diaphragm. Insert a suture thread under the trachea using tweezers and intubate the trachea with a sterile, flexible 22 g 0.9 mm x 25 mm I.V. catheter. Pull the two ends of the suture thread to bind the catheter to the trachea and knot the thread around the trachea. Take a volume of 1 ml of RPMI 1640 using a 1 ml syringe and attach it to the catheter. Push the plunger of the syringe to wash the lungs and immediately recover the liquid, storing it in a 15 ml tube. NOTE: If cytokines are to be analyzed, add protease inhibitors to RPMI 1640. Repeat this step three times with a total of 3 ml of RPMI. From now on, store the BAL fluid on ice. Go to step 6 for the collection and analysis of lungs. NOTE: Please note that not all of the liquid will be retrieved (2.8 ml maximum). For quantification of bacteria present in the BAL fluid, sample a small aliquot (300 µl), serially dilute 1:10 in sterile PBS, plate on TSA plates and incubate at 37 °C overnight. Count total cells using an inverted light optical microscope diluting an aliquot of the BAL fluid 1:2 with Tuerk solution in a Burker cell count chamber. Centrifuge the remaining BAL fluid at 330 x g for 8 min at 4 °C. Take the supernatant for ELISA cytokine analysis, storing it at -80 °C. Follow steps 5.10-5.13 for differential cell count by cytospin. If the pellet is red, lyse the erythrocytes resuspending the pellet in 250-300 µl of RBC lysis buffer diluted 1:10 in ultra-pure distilled water for 3 min. Neutralize with 2 ml PBS and centrifuge at 330 x g for 8 min at 4 °C. Discard the supernatant and resuspend the pellet in RPMI 10% fetal bovine serum (FBS). Use a volume that will provide 1 x 106 cells/ml, based on the total cell count. Place microscope slides and filters into appropriate slots in the cytospin with the cardboard filters facing the center of the cytospin. Pipette 150 µl of each sample into the appropriate wells of the cytospin and centrifuge in a cytocentrifuge at 300 x g for 5 min. Stain slides by Romanowsky staining using a commercial kit, according to the manufacturer's instructions and as described previously12. Follow steps 5.14-5.17 for MPO activity analysis. Centrifuge the remaining volume of BAL at 380 x g for 5 min at 4 °C. Discard the supernatant and resuspend the pellet in 250 µl of Hexadecyltrimethylammonium chloride 0.5% in ultra-pure distilled water to lyse the cells. The suspension can be frozen at -20 °C for several days before performing the assay. Centrifuge at 16,000 x g for 30 min at 4 °C and use the supernatant to perform MPO assay in 96-well plates, adding the sample in duplicate to each well and if needed, also proper dilutions of the sample. Add to each sample in the wells an equal volume of 3,3',5,5'-tetramethylbenzidine (TMB) as a substrate for peroxidase. Allow the reaction to take place in the dark for at least 5 min and until there is no further development in the color. Stop the reaction by adding 2 M H2SO4 and measure the OD at 450 nm. The OD value will be directly proportional to peroxidase activity. Immediately after BAL fluid collection, excise lungs from the mouse, rinse them in sterile PBS, separate lobes, put them in a round-bottom tube with 2 ml of sterile PBS and store on ice. NOTE: If cytokines are to be analyzed, add protease inhibitors to PBS to the tubes. Aseptically homogenize lungs, take a small aliquot (300 µl) from the homogenate, serially dilute 1:10 in PBS, plate on TSA plates and incubate at 37 °C overnight. Please note that the total airway bacterial load will be the sum of the CFUs found in BAL fluid and lung. Centrifuge the remaining homogenate at 16,000 x g for 30 min at 4 °C. Take the supernatant for ELISA cytokine analysis, and store at -80 °C. Perform histological analysis only on the lungs in which BAL fluid has not been collected, to preserve lung aspect and properties. Euthanize the mouse by CO2 inhalation. Expose the thoracic cage by a vertical cut of the skin, expose the lungs by cutting the diaphragm. Excise lungs, rinse them in PBS, separate the lobes, put them in a tube containing 5-10 ml 10% neutral buffered formalin (4% formaldehyde) and store at 4 °C protected from light. Embed lungs in paraffin, using standard procedures. 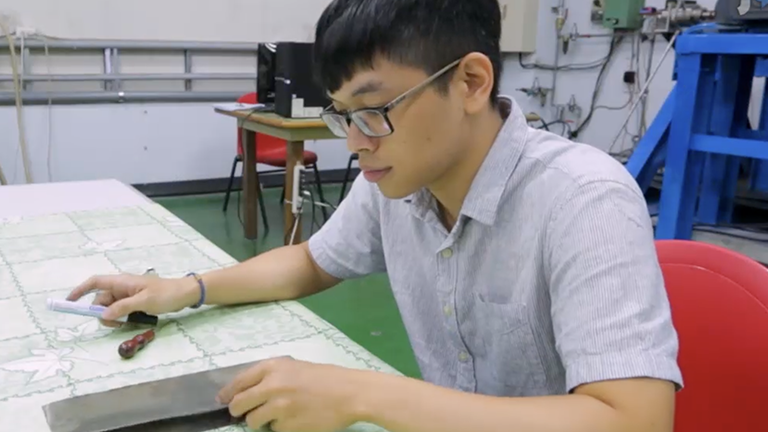 Cut 5 µm thick sections using a microtome. Stain slides with hematoxylin and eosin and cover the slides with a coverslip, according to standard procedures. Examine slides using an inverted brightfield microscope and acquire images by connecting the microscope to a camera. When the protocol is done correctly, the P. aeruginosa agar-beads will measure between 100-200 µm and can be observed with an inverted light microscope by pipetting a small volume of the agar-beads suspension on a slide. Single bacterial cells are visible in the agar beads, as shown in detail in Figure 1. The choice of P. aeruginosa strain used in the agar-beads preparation is critical. Figure 2 and Table 1 show the data obtained following the infection of mice with P. aeruginosa PAO1 reference laboratory strain compared to RP73 clinical isolate. Mortality, observed within the first 3 days of infection, is low for both strains, but higher for PAO1 (Figures 2A and 2B). Considerable differences in terms of the percentage of chronic infection in the surviving mice can be observed between PAO1 and RP73 challenged mice. While at 3 days post-infection, all mice were still infected by both P. aeruginosa strains, after this time-point some mice cleared the bacteria and others developed a stable chronic infection. From 7 days onwards the percentage of chronically-infected mice remained stable up to 28 days for both the strains. PAO1 leads to chronic infection in a percentage of mice that ranged between 20-27.8% (Figure 2A), while for RP73 the percentage was 75-87.1% (Figure 2B), indicating that the P. aeruginosa clinical strain was more efficient in establishing a chronic infection compared to the PAO1 laboratory strain. Numbers of bacteria at 3 days post-infection were higher for PAO1 (5 x 107 CFU/lung) (Figure 2C and Table 1) compared to RP73 (1.3 x 106 CFU/lung) (Figure 2D), then from 7 days onwards, when chronic infection was established, the bacterial load stabilizes at between 104 and 105 CFU/lung for both strains. Once chronic infection is established, the number of CFU/lung does not change significantly over one month. Moreover, the bacterial load in the airways is similar among mice challenged with different bacterial strains9,13. Other read-outs, including the host inflammatory response and histopathology, can be measured at different time-points from challenge. Figure 3 shows the inflammatory response in terms of leukocyte recruitment in mouse BAL fluid 7 days from challenge with P. aeruginosa RP73 clinical strain embedded in agar-beads. RP73-infected mice were compared to uninfected mice. 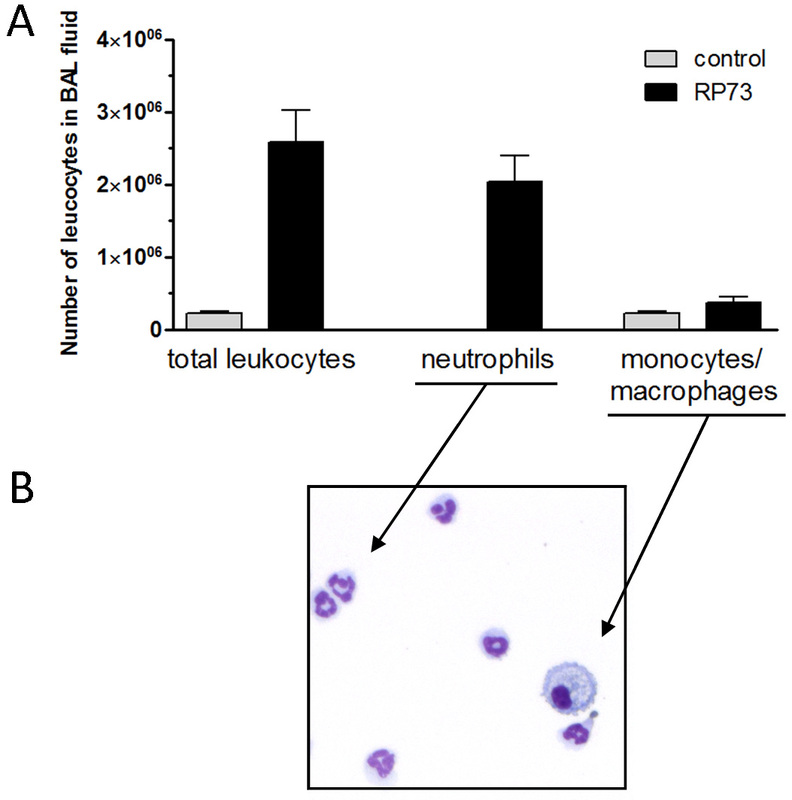 Differential cell count included neutrophils, macrophages, and lymphocytes. The number of total cells is considerably higher in RP73-infected mice compared to uninfected mice. Neutrophils, in particular, almost completely absent in the BAL fluid of not-infected mice, were the most represented cellular type in RP73-infected mice, indicating a considerable response by the innate immune system to chronic infection. The histopathological analysis of lungs from mice, chronically infected with P. aeruginosa RP73, shows that the infection is pluri-focal. Figures 4C and 4F show one lobe that is more involved than other lobes that are unaffected or marginally involved (Figures 4B and 4E). Beads can be observed in bronchial lumen and microcolonies of bacterial cells are visible in the beads (Figures 4C and 4F). Lung histopathology in the areas involved by infection showed inflammatory lesions in the bronchia and in the pulmonary parenchyma. The bronchia were filled by a massive neutrophil inflammation surrounding the beads, whereas the parenchyma was infiltrated by macrophages, lymphocytes and some neutrophils. Histology of a uninfected mouse was used as a control; both parenchyma and bronchia were clear from inflammatory cells (Figures 4A and 4D). Figure 2. Time course of P. aeruginosa chronic infection with PAO1 reference strain and RP73 clinical strain. C57BL/6NCrl (20-22 g) male mice were infected by intratracheal injection with 1 to 5 x 106 CFU of P. aeruginosa strain PAO1 (A and C) or RP73 (B and D) embedded in agar-beads. For each time-point, histograms represent the percentage mortality induced by bacteremia (red) and survival (grey) or the percentage of animals that cleared the infection (white) and those able to establish a chronic infection (green) (A and B). Surviving mice were euthanized at the indicated time-points, and the lungs were harvested, homogenized, and cultured on TSA plates to determine the bacterial load. The growth curves of PAO1 and RP73 strains in murine lungs are shown (C and D). Dots represent individual measurements and horizontal lines represent median values. Statistical significance by Fisher's test is indicated: * p<0.05, ** p<0.01, *** p<0.001. Click here to view larger image. Table 1. Time course of P. aeruginosa chronic infection with PAO1 reference strain and RP73 clinical strain. 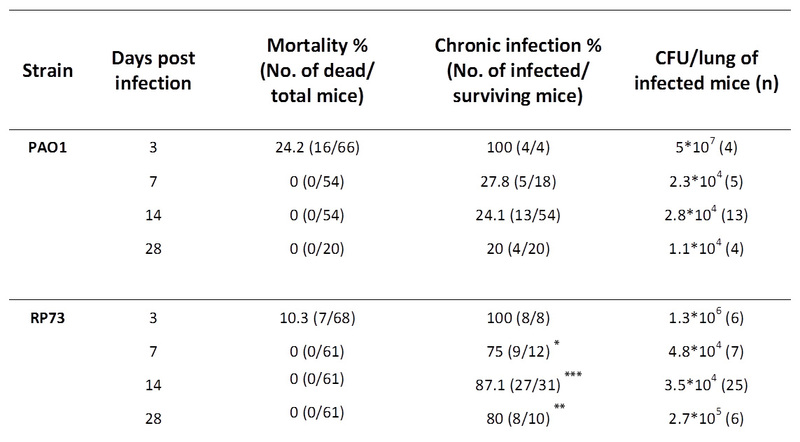 Percentages of mortality and of chronic infection of PAO1 and RP73 infected mice and number of CFUs per lung (median) are shown. Values are selected from 2-4 different experiments. n, no. of pooled mice analyzed for each condition. Statistical significance by Fisher's test is indicated: * p<0.05, ** p<0.01, *** p<0.001. Click here to view larger image. Figure 3. Evaluation of inflammation in BAL fluid after 7 days of chronic infection with RP73 clinical strain. (A) The graph shows the content of total leukocytes, neutrophils and monocytes/macrophages recovered in the BAL fluid of RP73 chronically infected mice after 7 days from challenge compared to uninfected mice (control). Mean values and SEM are represented. (B) In the box below arrows indicate neutrophils and a macrophage as seen in a spot on a slide after cytospin. Click here to view larger image. Figure 4. Hematoxylin and eosin staining on histological sections of lungs after 7 days of chronic infection with RP73 clinical strain. 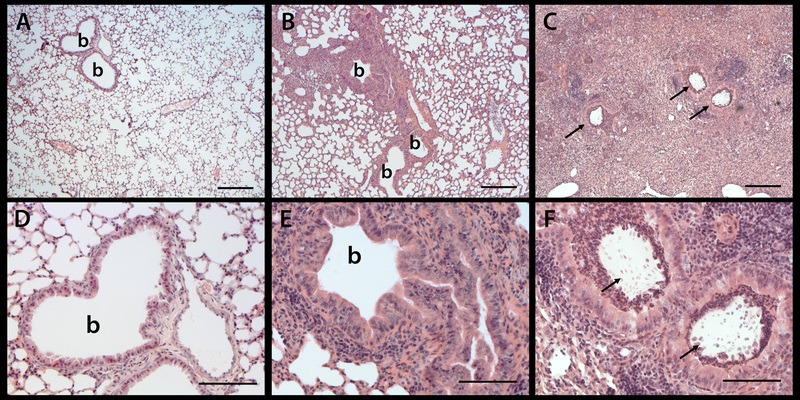 The panel shows hematoxylin and eosin staining of lung sections of uninfected mice (A and D) and of mice challenged with agar-beads containing RP73 (B, C, E, F). The infection is pluri-focal and generally involves one or more lung lobes (C and F), whereas the others are unaffected or marginally involved (B and E). Arrows indicate agar beads deposited in the bronchial lumen (b). Lines (A, B, C) 250 µm; lines (D, E, F) 100 µm. Click here to view larger image. The critical steps in the P. aeruginosa-beads preparation and mouse challenge are reported below. The P. aeruginosa strain used for mice challenge is critical. Mortality, chronic infection or clearance may differ significantly depending on the bacterial strain used for the challenge. The P. aeruginosa RP73 clinical strain was preferred over the PAO1 reference laboratory strain since it resulted in a comparatively lower mortality, more severe lesions, and higher chronic infection. Drug testing in preclinical studies should be performed with P. aeruginosa strains selected for their high efficiency in establishing long-term chronic infection. This minimizes the number of mice that are consistent with the requirements of scientific validation and statistical analysis10,11. The individual P. aeruginosa agar-bead preparations vary in size and in CFU/ml. An average diameter of 150 µm with 2 x 107 CFU/ml is considered optimal. Bead size is affected by the stirring rate during the cooling phase (step 2.9). Beads stirred at top speed are small and spherical (<50 µm) while those stirred very slowly are large and amorphous (>1 mm). In addition, when the final dilution for challenge is prepared, beads with a low bacterial load can be sticky while those with high bacterial load can be excessively diluted. Inoculation of mice with sticky beads is associated with high mortality due to mice choking soon after challenge, while excessively diluted beads may result in an absence of chronic infection. The optimal volume of intratracheal injection is 50 µl but higher volumes of up to 100 µl can be inoculated. Differences in mortality or chronic infection of mice are rarely observed when the inoculated dose ranges between 5 x 105 and 5 x 106 CFU/mouse. Appropriate bacterial growth medium must be used for agar beads formation. In this instance, P. aeruginosa was embedded in TSA; other papers reported that, Burkholderia cenocepacia was included in nutrient broth agar14,15. Agar beads should provide a microanaerobic environment with essential nutrients available for bacterial proliferation from single cells to microcolonies9. Respiratory effort differs depending on the anesthetic and dose used, and affects mortality after surgery. Ketamine at a dose of 0.1 mg/g body weight andxylazine at a dose of 0.01 mg/g body weight are the optimal choices. Respiration is normal when mice are intubated with the catheter and visibly shallower when mice are inoculated by P. aeruginosa agar-beads. Ideally, the injection of P. aeruginosa agar-beads should be performed slowly with an optimal volume of 50 µl. Higher volumes of up to 100 µl could result in higher mortality and greater difficulties in mice recovery. All mice are adequately infected when challenged by intratracheal surgery. The P. aeruginosa RP73 agar bead-induced chronic pneumonia indicates that in this model the infection is pluri-focal and generally involves one or more lung lobes without compromising the entire lung. Consequently, evaluation of bacterial load and inflammatory response must be carried out on total lung. The analysis of selective lobes does not produce valid results. An uninfected group of mice should be added as a control and compared to infected mice to detect any potential abnormality in cell recruitment in BAL fluid or in the histology of the lung due to contaminations or mistake in the procedure. This model was established in a BSL-2 laboratory with all laboratory personnel should be trained in the appropriate skills for mouse observation. The mice were monitored twice per day for the following parameters: piloerection, attitude, locomotion, breathing, curiosity, nasal secretion, grooming and dehydration. Mice that lost ≥20% body weight and showed evidence of severe clinical disease, such as scruffy coat, inactivity, loss of appetite, poor locomotion, or painful posture, were euthanized before the termination of the experiment. Mice infected with P. aeruginosa RP73 agar-beads showed lower signs of discomfort within three days from infection when compared to PAO1-infected mice. After this time point some mice cleared the bacteria and others developed a stable chronic infection, lasting up to 28 days. We demonstrated that the model of chronic infection we propose in this paper is able to induce a stable P. aeruginosa chronic infection in mice. This method has been optimized to study the molecular mechanisms underlying the pathogen virulence and host defense8,9,16 or for drug testing of antibacterial and anti-inflammatory molecules10,11. The preclinical validation of these compounds in appropriate animal models is essential for future therapeutic interventions for lung infections in patients with CF. Research in Bragonzi’s laboratory has been funded by the Italian Cystic Fibrosis Foundation (CFaCore) and EU-F7-2009-223670. Part of this work was carried out in ALEMBIC, an advanced microscopy laboratory, and mouse histopathology was performed in the Unit of Pathological Anatomy (San Raffaele Scientific Institute). Gibson, R., Burns, J. L., Ramsey, B. W. Pathophysiology and management of pulmonary infections in cystic fibrosis. Am. J. Respir. Crit. Care. 168, 918-951 (2003). Bragonzi, A. Murine models of acute and chronic lung infection with cystic fibrosis pathogens. IJMM. 300, 584-593 (2010). Cash, H. A., McCullough, B., Johanson, W. G. Jr, Bass, J. A. A rat model of chronic respiratory infection with Pseudomonas aeruginosa. Am. Rev. Respir. Dis. 119, 453-459 (1979). Starke, J. R., Langston, C., Baker, C. J. A mouse model of chronic pulmonary infection with Pseudomonas aeruginosa and Pseudomonas cepacia. Pediatr. Res. 22, 698-702 (1987). 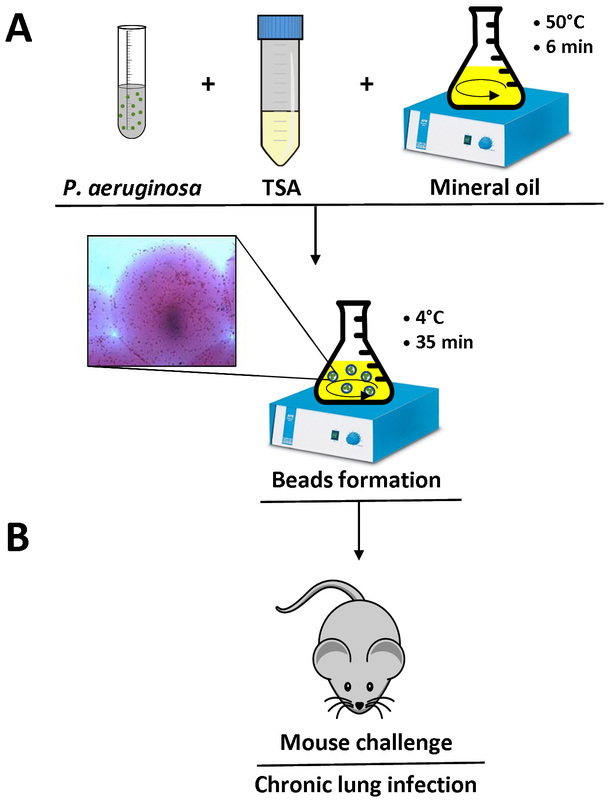 Pedersen, S. S., Hansen, B. L., Hansen, G. N. Induction of experimental chronic Pseudomonas aeruginosa lung infection with P. aeruginosa entrapped in alginate microspheres. APMIS. 98, 203-211 (1990). Bragonzi, A., et al. Nonmucoid Pseudomonas aeruginosa expresses alginate in the lungs of patients with cystic fibrosis and in a mouse model. J. Infect. Dis. 192, 410-419 (2005). van Heeckeren, A. M. Murine models of chronic Pseudomonas aeruginosa lung infection. Lab. Anim. 36, 291-312 (2002). Bragonzi, A., et al. Pseudomonas aeruginosa microevolution during cystic fibrosis lung infection establishes clones with adapted virulence AJRCCM. 180, 138-145 (2009). Kukavica-Ibrulj, I., Facchini, M., Cigana, C., Levesque, R. C., Bragonzi, A. Assessing Pseudomonas aeruginosa virulence and the host response using murine models of acute and chronic lung infection. Methods in Pseudomonas aeruginosa: Humana Press. Filloux, S., Ramos, J. L. (2014). Moalli, F., et al. The Therapeutic Potential of the Humoral Pattern Recognition Molecule PTX3 in Chronic Lung Infection Caused by Pseudomonas aeruginosa. J. Immunol. 186, 5425-5534 Forthcoming. Paroni, M. Response of CFTR-deficient mice to long-term Pseudomonas aeruginosa chronic infection and PTX3 therapeutic treatment. J. Infect. Dis. In press, Forthcoming. Maxeiner, J., Karwot, R., Hausding, M., Sauer, K. A., Scholtes, P., Finotto, S. A method to enable the investigation of murine bronchial immune cells, their cytokines and mediators. Nat. Protoc. 2, 105-112 (2007). Bragonzi, A., et al. Pseudomonas aeruginosa microevolution during cystic fibrosis lung infection establishes clones with adapted virulence. AJRCCM. In press, (2009). Pirone, L., et al. Burkholderia cenocepacia strains isolated from cystic fibrosis patients are apparently more invasive and more virulent than rhizosphere strains. Environ. Microbiol. 10, 2773-2784 (2008). Bragonzi, A., et al. Modelling co-infection of the cystic fibrosis lung by Pseudomonas aeruginosa and Burkholderia cenocepacia reveals influences on biofilm formation and host response. PLoS One. 7, Forthcoming. Bianconi, I., et al. Positive signature-tagged mutagenesis in Pseudomonas aeruginosa: tracking patho-adaptive mutations promoting long-term airways chronic infection. PLoS Pathog.. 7, (2011).